The other day I received this figurine. 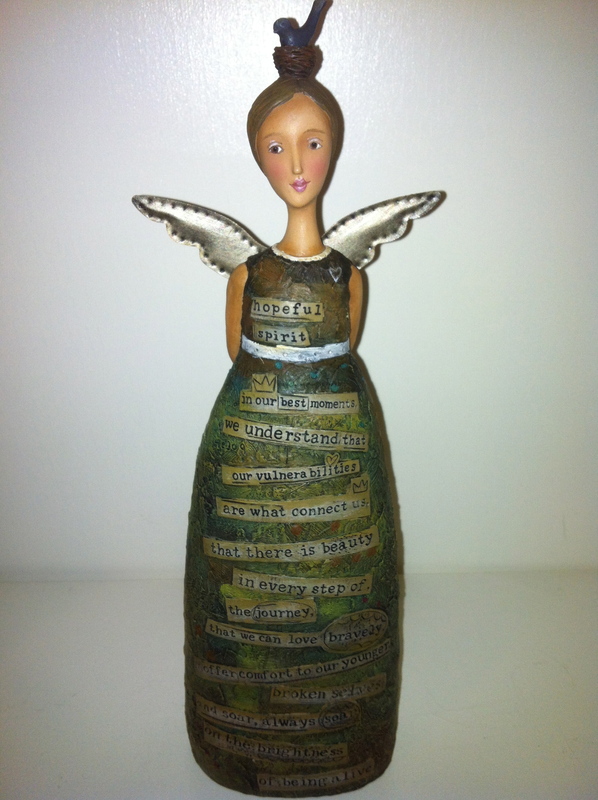 She stands almost 11 inches tall and is a bit more earth toned than the lighting on the photo show. She’s a lovely mixture of greens and browns and burnished coppery tones. She is really quite wonderful. If you’ve been in my house, you’ve probably noticed that the number of books vastly outnumber the number of nicknacks. While appearing to be a decorating choice, it is really more of a statement regarding my approach to dusting…I don’t dust aside from a once or twice a decade and books more effectively hide dust than items begging a closer inspection. However, I do have a collection of Demdaco pieces that I love. Now I have this new Kelly Rae Roberts/Demdaco piece gracing the collection on my mantle. I love it. And the nice thing about needing to dust the things you love is the chance to touch an item that reminds you of how you were touched by the person or time relating to when you received it. that we can love bravely. The poetry student that lives in my heart loves this poem and its use (or misuse) of conventions and enjambment to depict the hopeful spirit. Many, many thank yous to my friend Luna Pereira of Esencia Bodywork in Portland, Oregon for seeing the hopeful spirit in everyone, but especially within me. May each and every one of us have a best moment today and every day. This entry was posted in Front Page and tagged Demdaco figurines, Esencia Bodywork, hope, Kelly Rae Roberts, Luna Pereira, massage by kristina. Bookmark the permalink. Also, I’m the same way. All books, no knick-knacks. Beautiful piece and beautiful words! Thank you for sharing it. That is a lovely piece and a lovely thought. It came at a time in my day when I really need a little of a hopeful spirit.